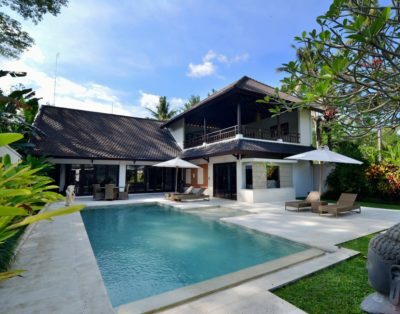 Villa Abakoi is a sprawling property a few minutes from the most popular area of Jalan Drupadi in Seminyak. 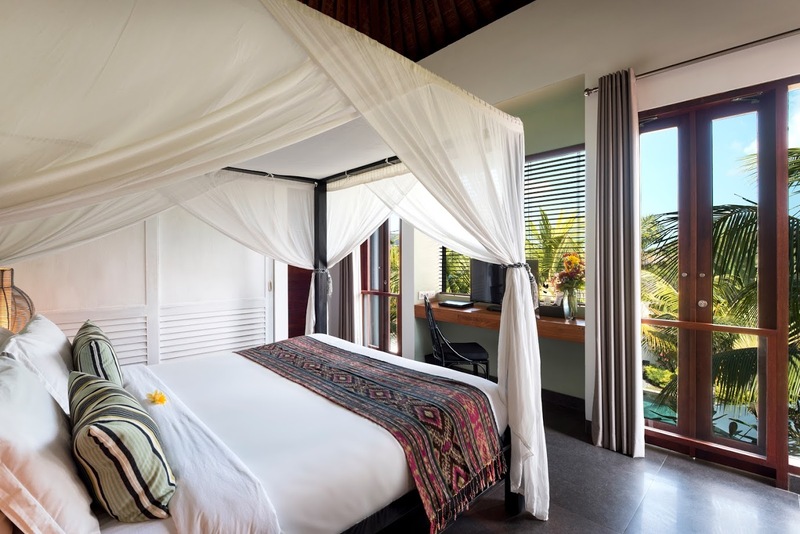 The six-bedroom resort is spread across 700sqm of land featuring lavish gardens, tropical plants, a 16-metre swimming pool, and separate pavilions housing living areas and the bedrooms. 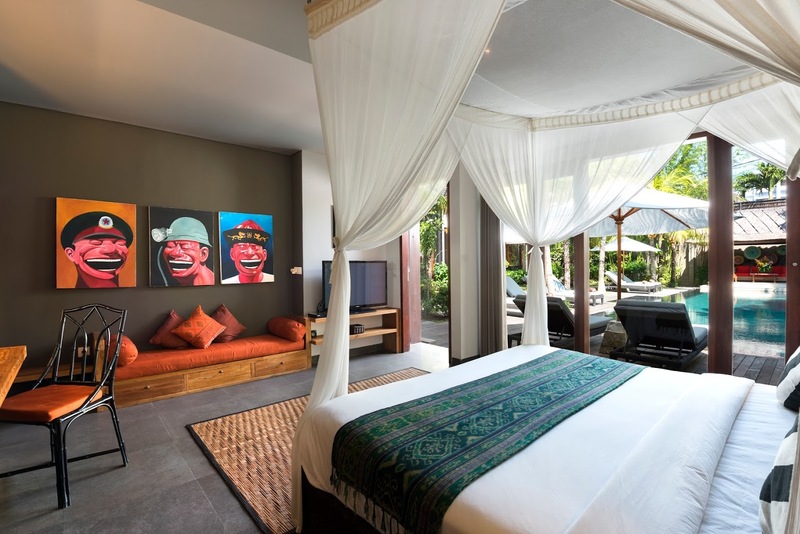 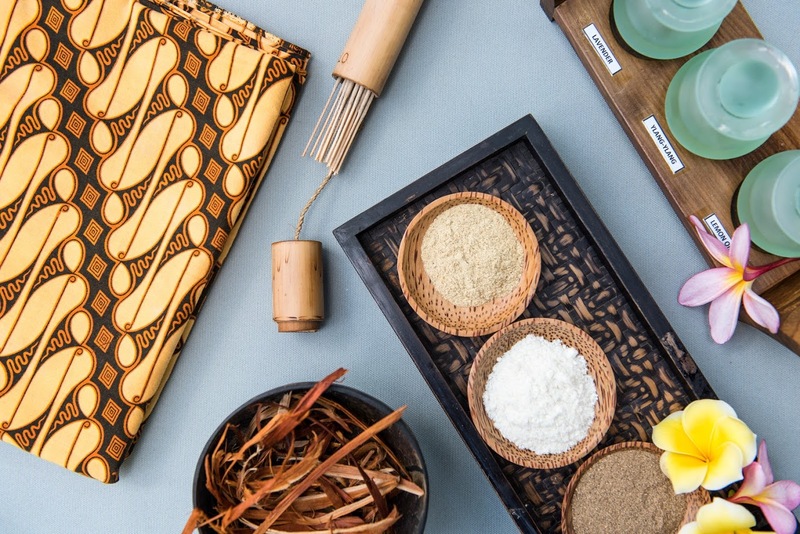 The traditional décor is infused with rich, Balinese heritage so you will feel like you are in another world altogether! 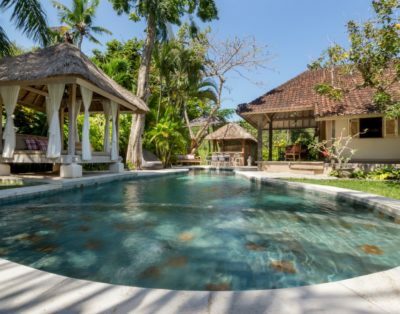 Villa Abakoi is a great place to spend time in with your friends and family as it has something for everyone. 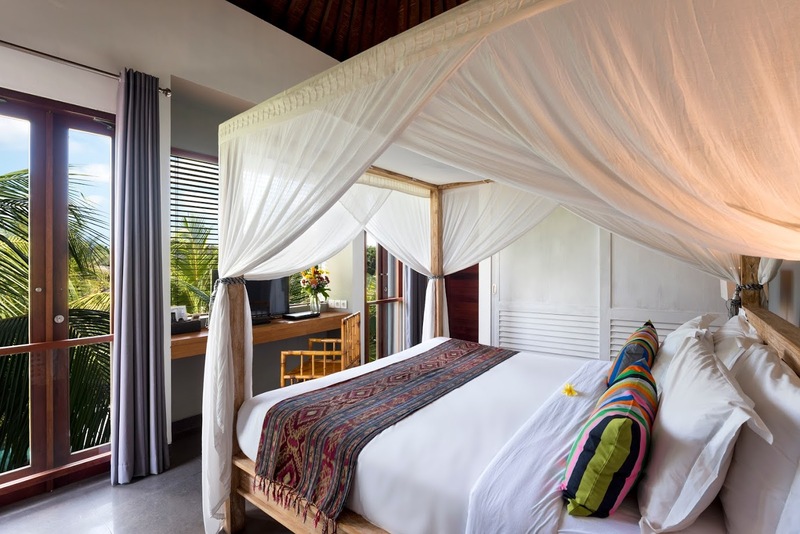 A beautiful landscape is always soothing to the eyes and the soul, especially if you are looking for a place where you can truly relax amidst raw nature. 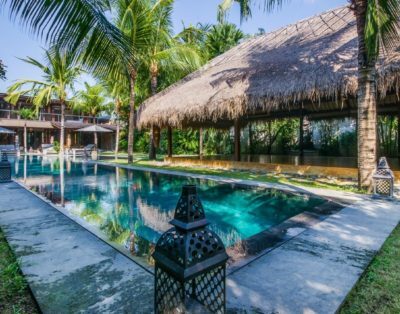 The outdoors at Villa Abakoi is significantly rich with tropical vegetation featuring towering palm trees, leafy plants, and verdant gardens. 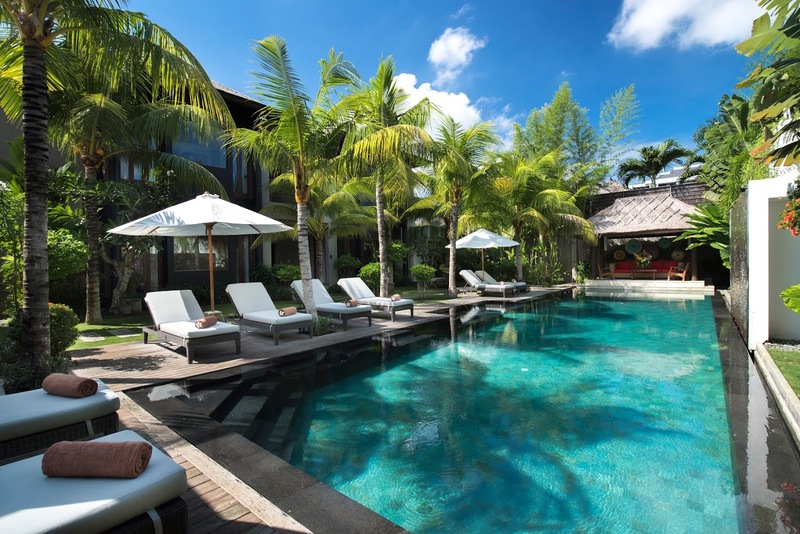 In-between all this resides the 16-metre swimming pool inviting you to take a dive into its cool waters. 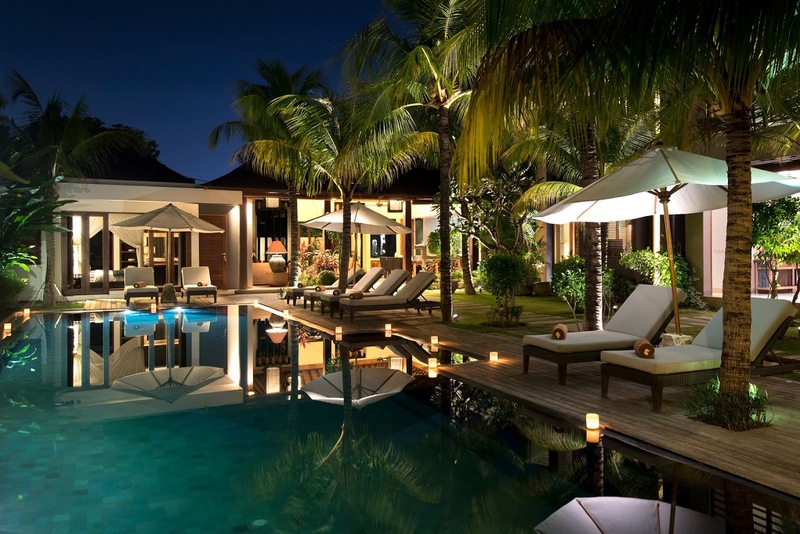 Lounge on the deck loungers on the pool deck that are placed under large umbrellas to offer you shade. 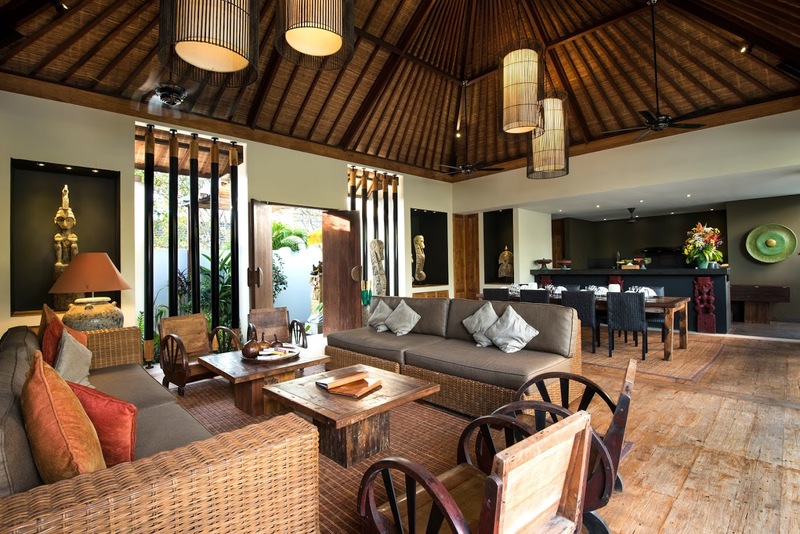 Under a thatched-roof bale, at the end of the pool, there are comfy chairs where you can enjoy a cup of tea with your loved ones. 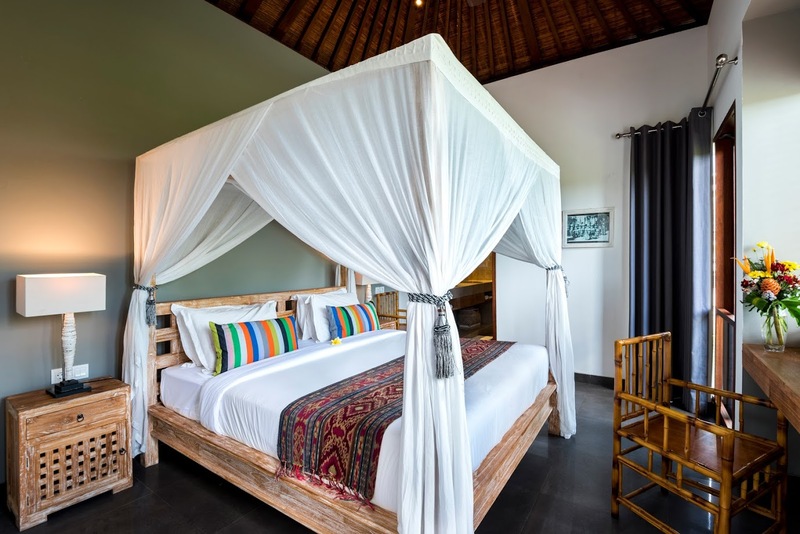 The living pavilion at Villa Abakoi is a traditional Balinese structure with alang-alang roof donned with designer lighting to complement the customary décor. 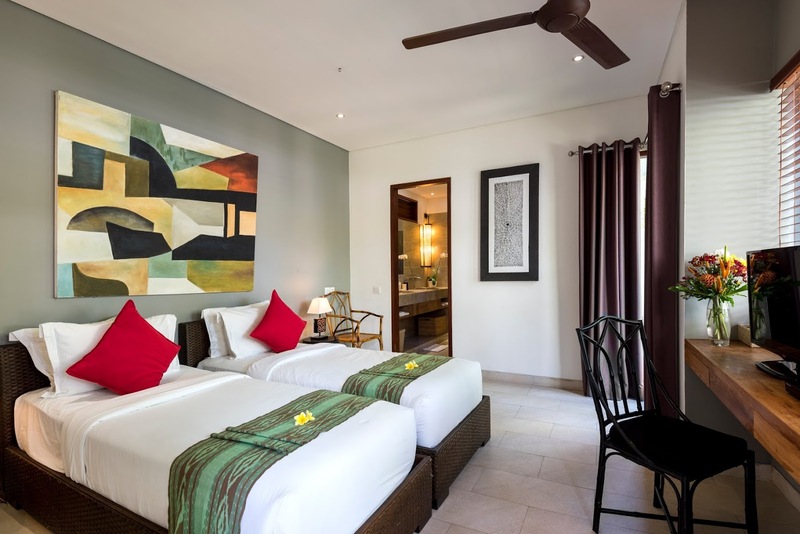 The wooden flooring is furnished with comfortable, rattan sofas and the aesthetically pleasing space is decorated with collectible items from across the ocean and vibrant artwork on the walls. 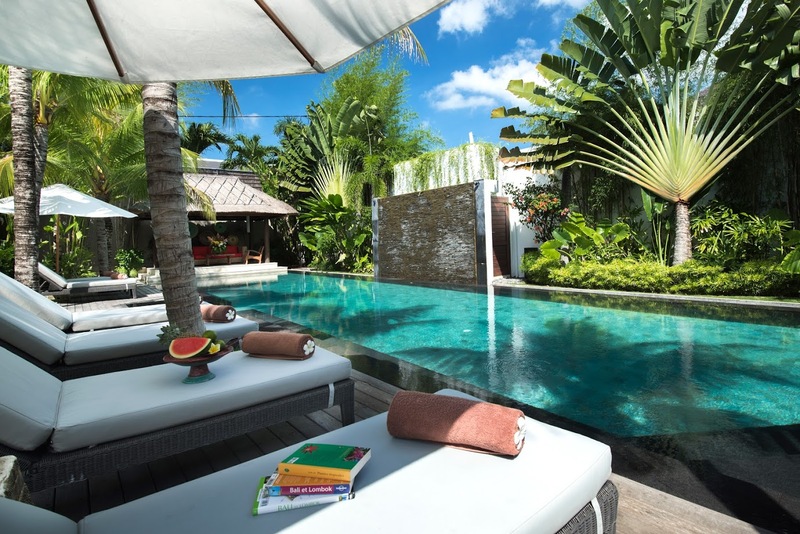 The open-plan design allows you to view the pool and garden from the comfort of your living space at all times. 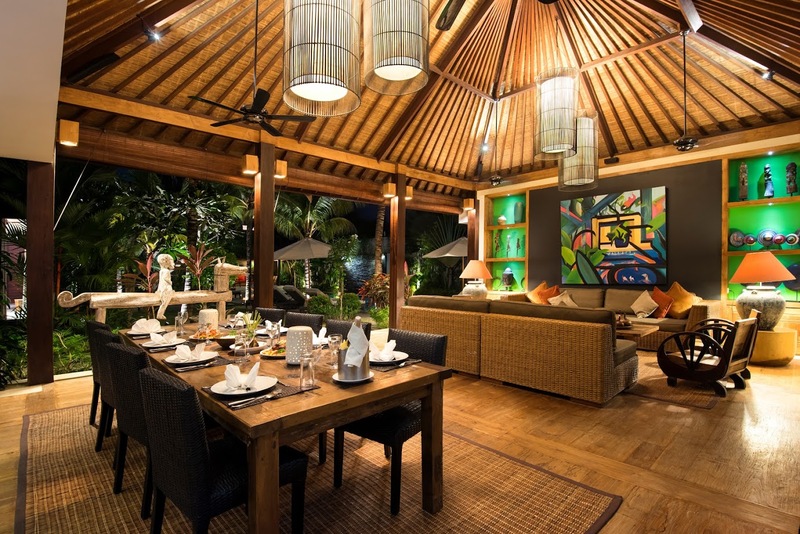 Once the sun sets, the living area looks even more promising for its stunning lights overhead as well as those on the wooden beams. 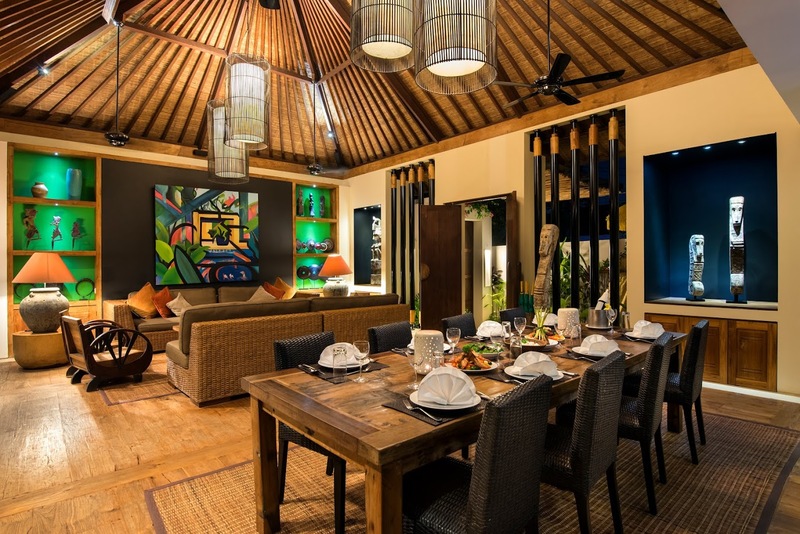 The dining area sits to the side and features an eight-seater dining table with beautiful rattan chairs. 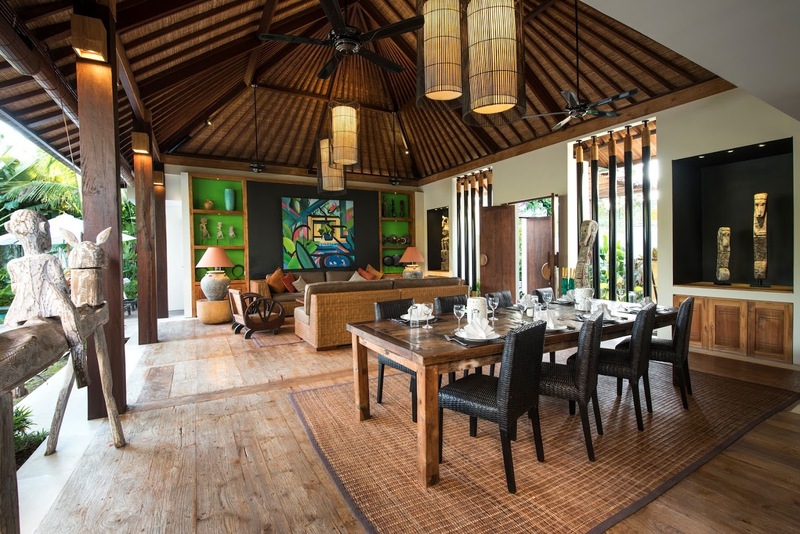 The remarkable furnishing and décor enhance the opulence of the villa, and exude a luxurious and inviting atmosphere. 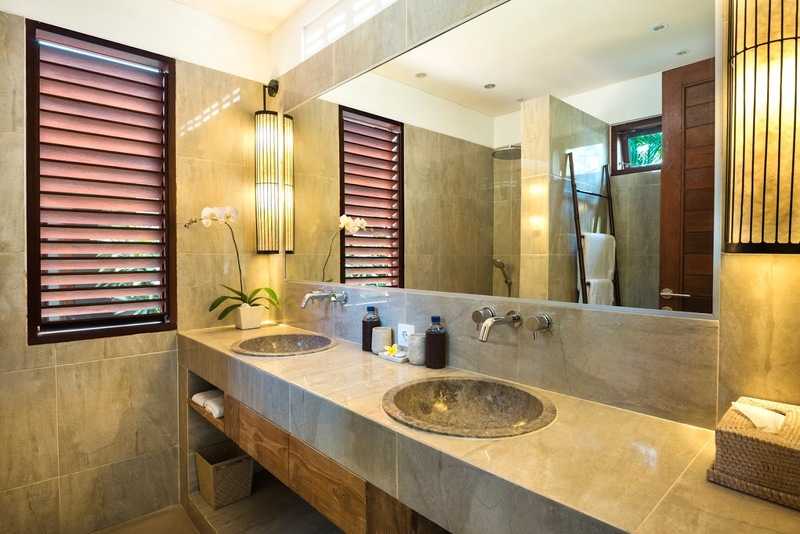 At the end of the pavilion, there is the modern kitchen which is fully-equipped and fitted with all necessary amenities and appliances. 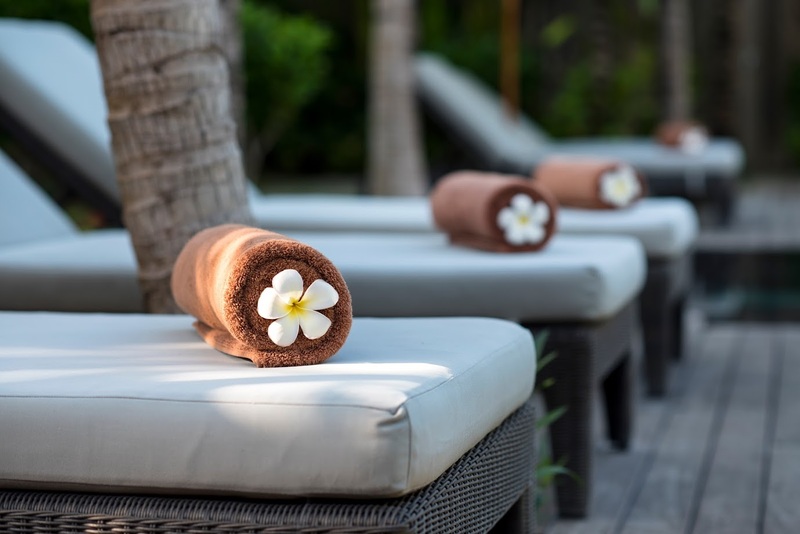 There is a massage pavilion outdoors with a massage bed, where the staff can arrange an in-house massages and spa treatments. 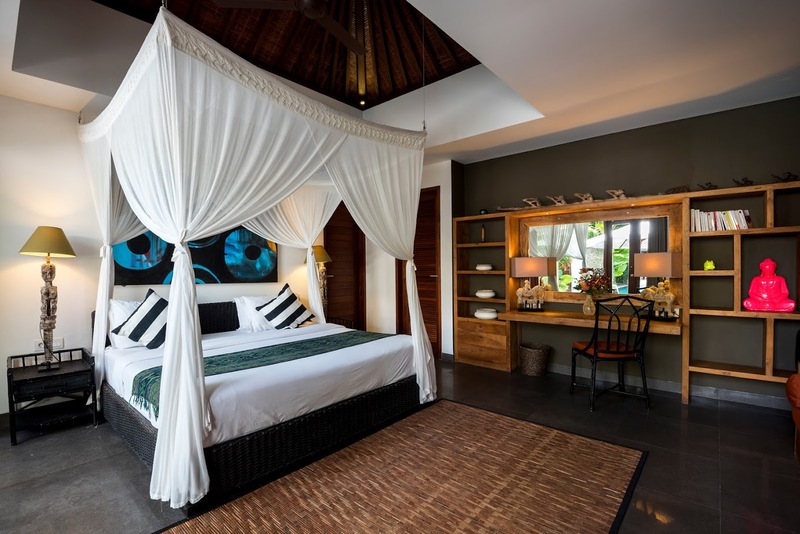 The six bedrooms at Villa Abakoi are spread across two pavilions with the master bedroom being adjacent to the living area. 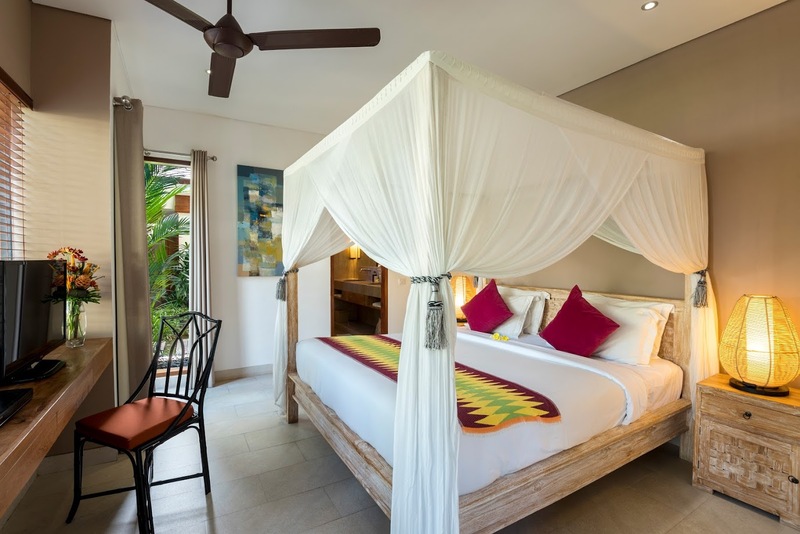 It is furnished with a king-sized bed for the utmost comfort and also boasts of a flat-screen TV and DVD player. 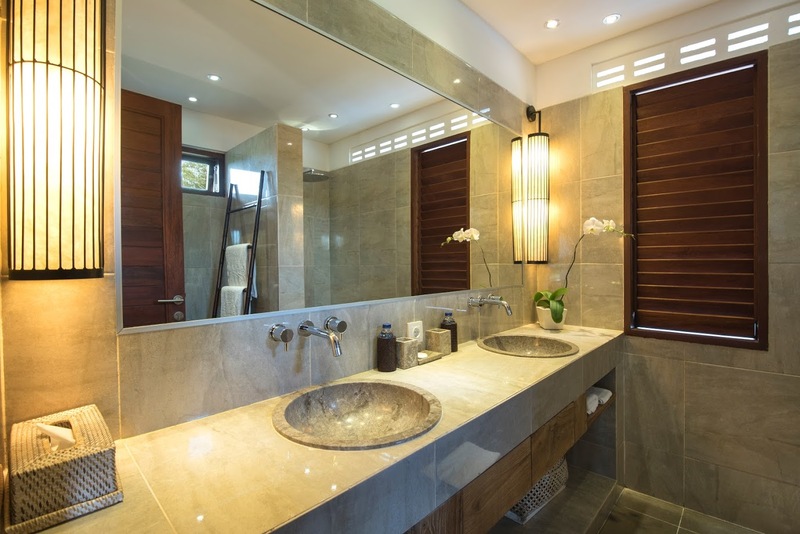 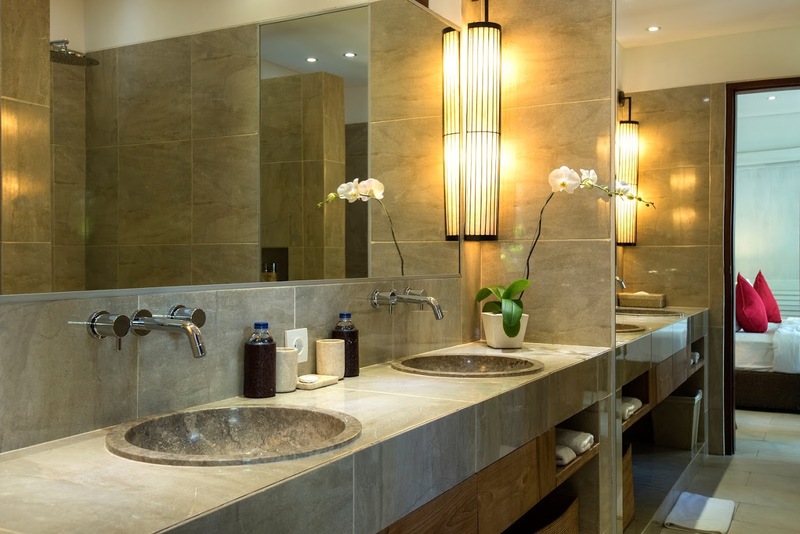 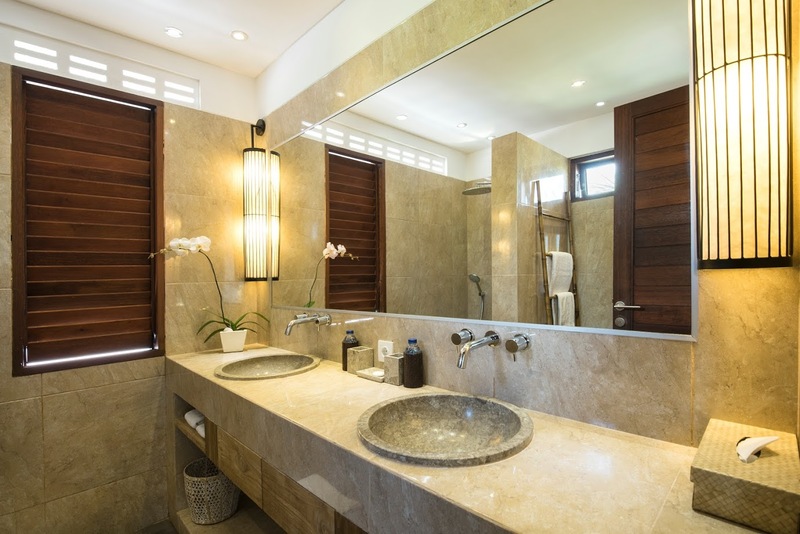 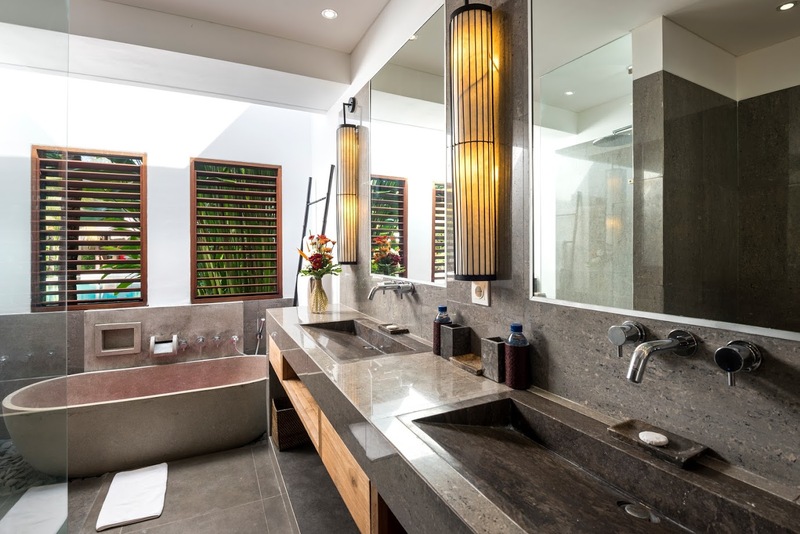 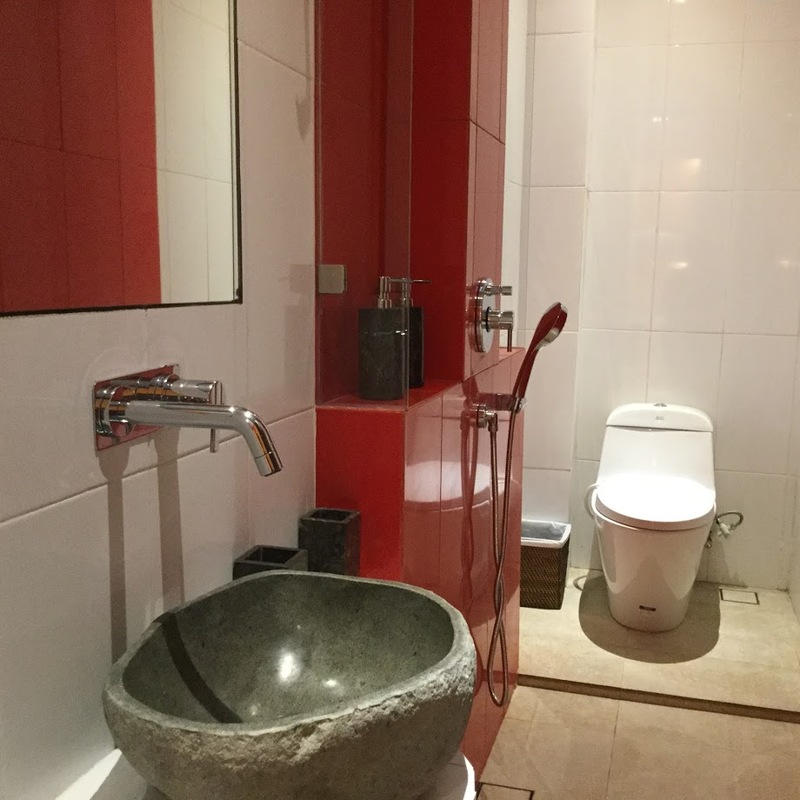 The en-suite bathroom features natural stone basins, a bathtub, and a shower area. 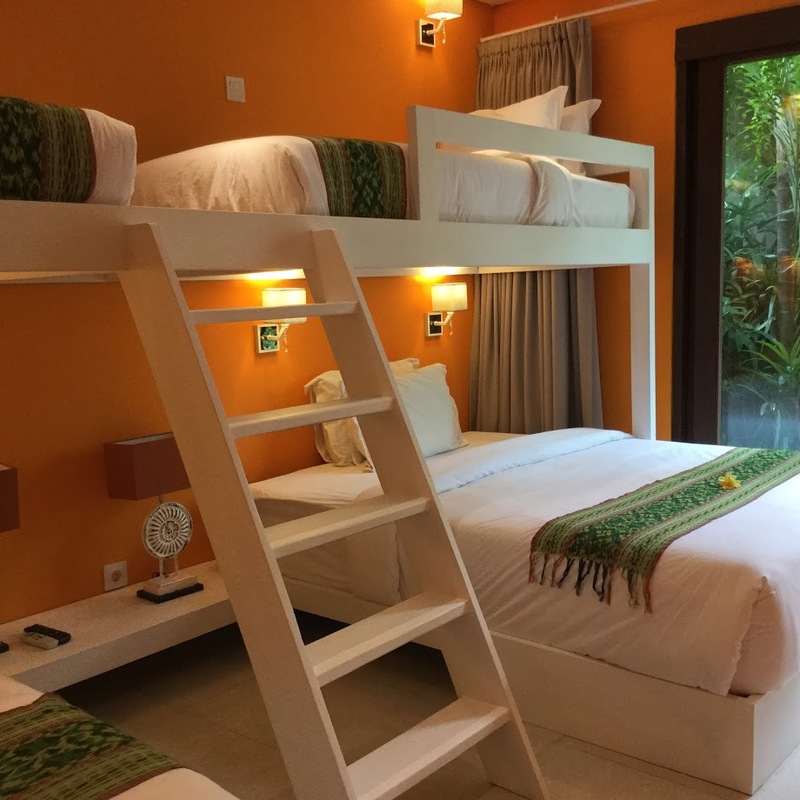 The other four bedrooms are housed in a separate pavilion which has two rooms on each of its two floors. 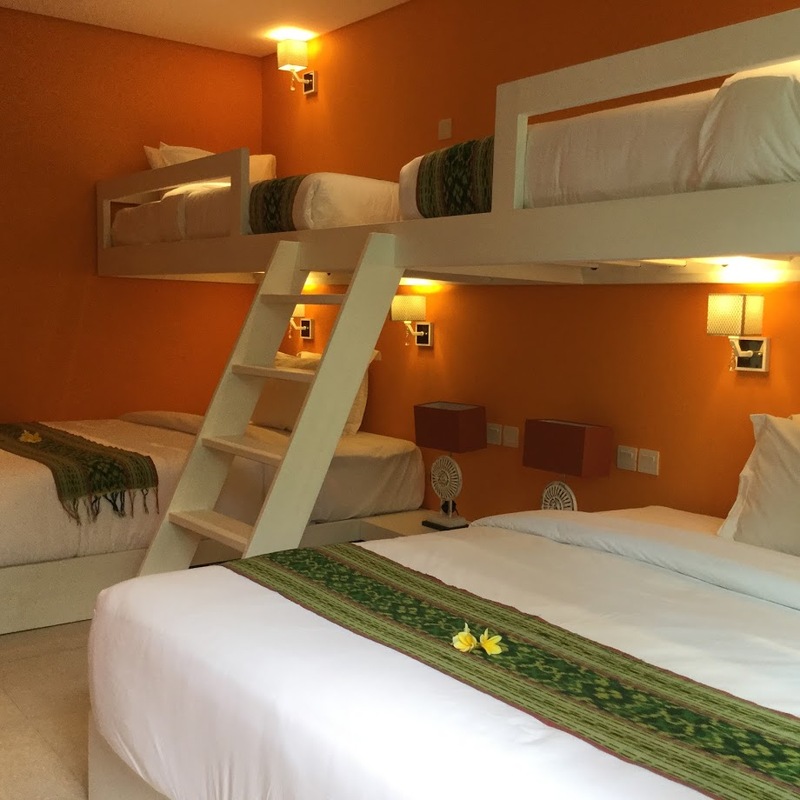 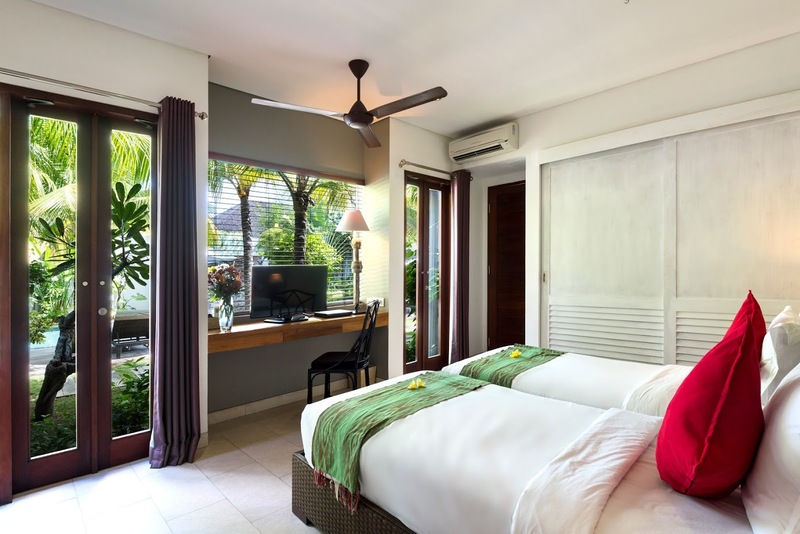 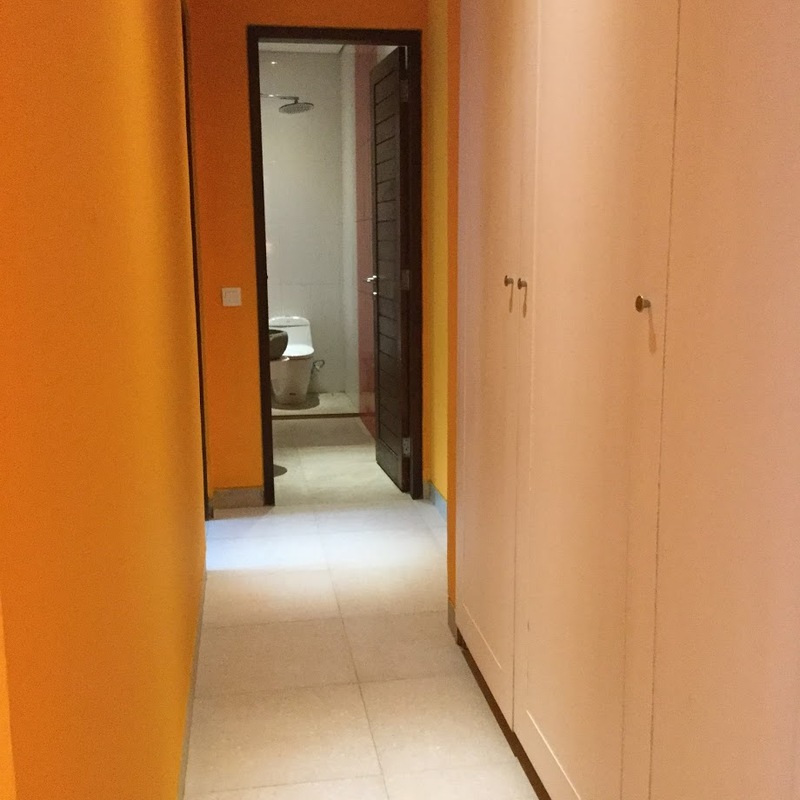 While three of the bedrooms are furnished with queen-sized beds, the fourth bedroom has single beds, and there is a fifth room with bunk beds which is suitable for kids. 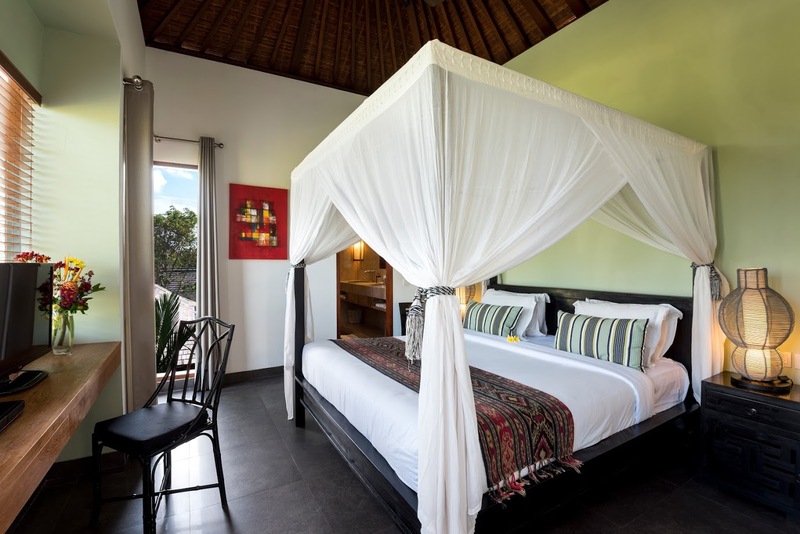 Each of the bedrooms has televisions and DVD players for your enjoyment as well as en-suite bathrooms. 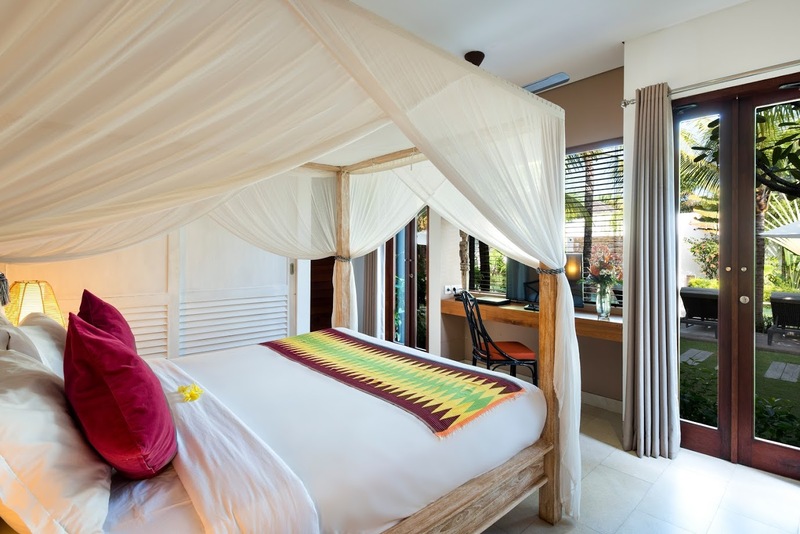 An entire team at Villa Abakoi is there to help make your stay a comfortable one. 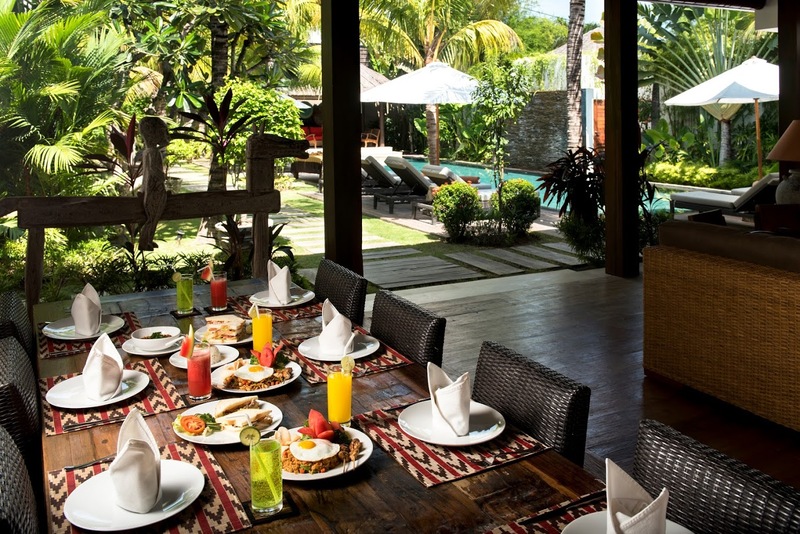 A villa manager will look after all the management and even make plans and bookings for excursions on your behalf. 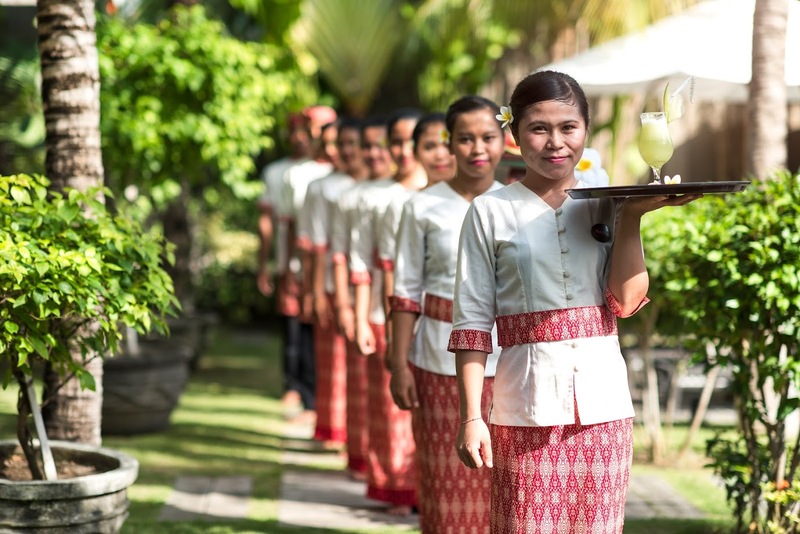 The staff includes butlers and helpers to look after everything for you. 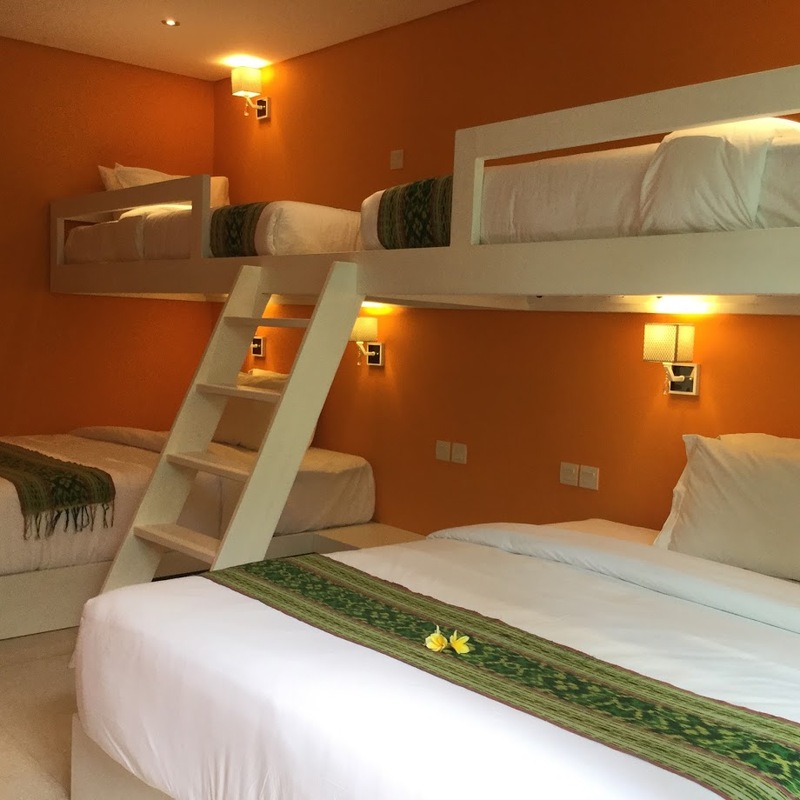 If desired, the staff can even call in a chef to delight you with local and international cuisines and other services that can be arranged include babysitters, spa therapists, and night security, at added costs. 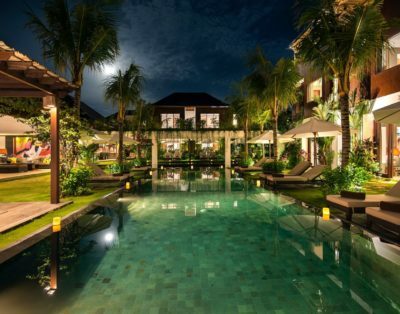 With the best location in Seminyak, you have the opportunity to walk all the way to famous Oberoi ‘eat-street’ which features popular restaurants include La Favela, La Lucciola, and Barbie Q. 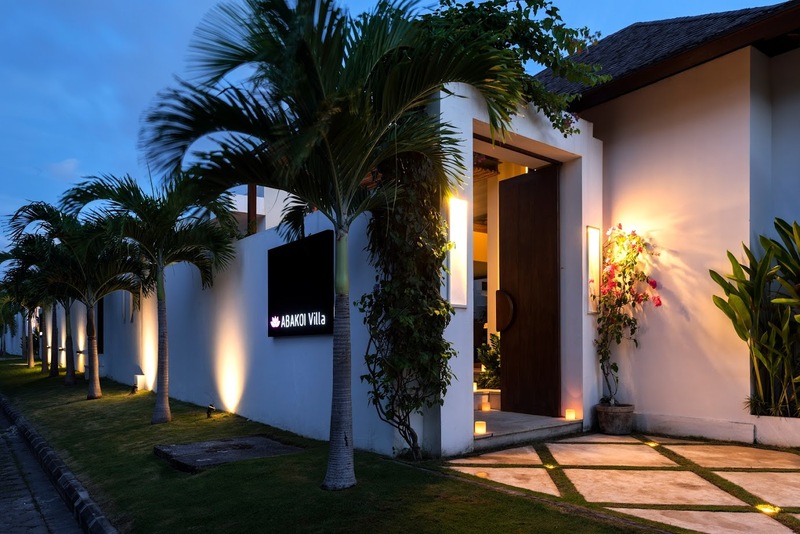 There are high-end shops and boutique store on the same strip that you can explore and rest at the fabulous cafes once you are tired. 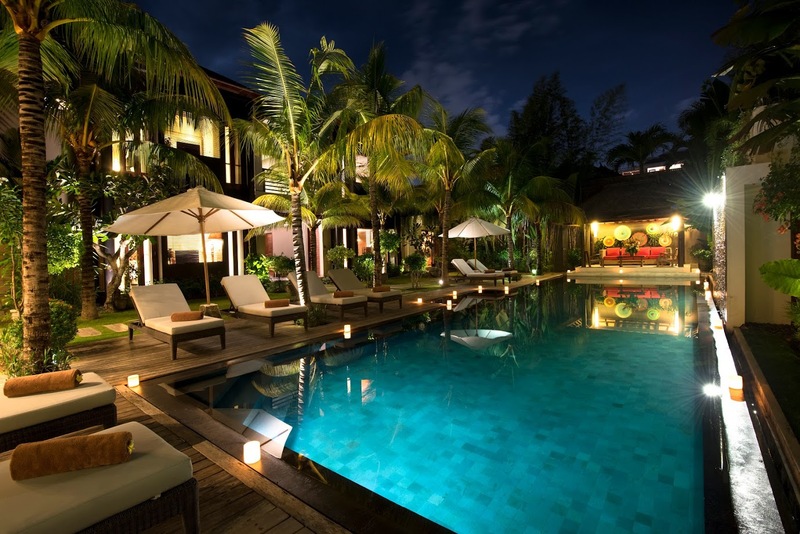 End the day at the famous beach clubs like Ku De Ta and Potato Head.